Leaf springs aren't suited to the torque of a V8 engine. 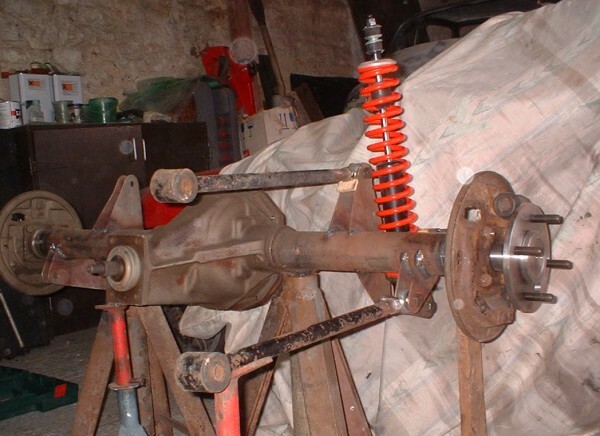 On full power one side of the axle goes upwards, straightening the leaf spring, and the other side goes down, bending the spring. 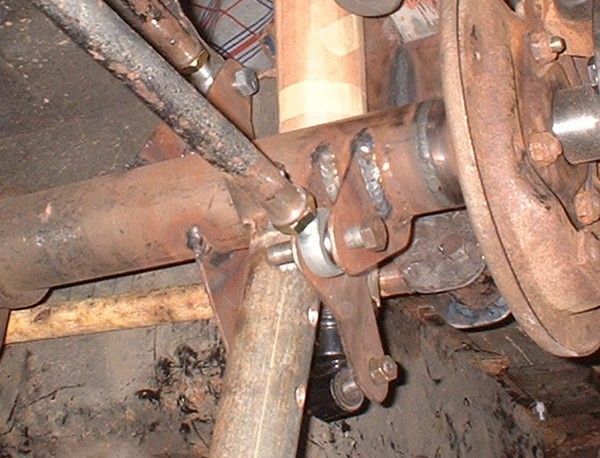 The bent spring is shorter than the straight spring so the axle steers to one side. I was having to apply about a quarter of a turn of steering lock to correct the torque steer. Something had to be done before I unleashed the increased torque of the new engine onto the unsuspecting road. 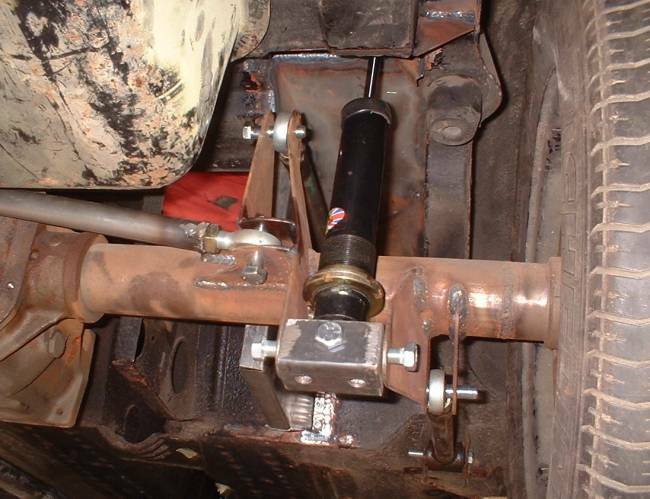 The solution was to separate the control of the axle from the spring by fitting 4-link rear suspension. The suspension will feature four parallel trailing links, a Panhard Rod, and coil over damper spring units. The trailing arms will not bend like leaf springs. Under torque one link will go upwards and one downwards, so the axle will continue to point straight ahead. The arrangement of the links can be seen in this shot of the axle removed from the car. 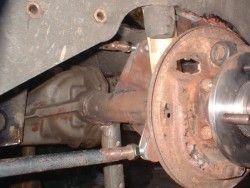 The axle itself started life on a Rover SD1 and has since been shortened by about 12 inches. The halfshafts are bespoke items made in the USA as shortened halfshafts have a reputation for breaking. The upper and lower arms are parallel and of equal length. They are 18 inches long and are spaced vertically by 9 inches. The upper arm is positioned inboard of the lower arm to clear the chassis and the coil spring. Parallel arms are sensible for a road car (in my view) as they do not restrict axle roll. The lower arm mounts to the body in the original spring mounting bracket. The side of the battery tray will be moved inboard to form part of the inner mounting for the upper arm. Each trailing arm will have a spherical bearing on the end, attached to the axle in double shear by 3mm plates. The arms in the photograph are mock up arms used for positioning and will be replaced by specially fabricated arms. The coil over damper unit fits neatly behind the axle. The upper arm is positioned 9 inches above the lower arm which places it just beneath the floor under the rear seat. I need to allow for 3 inches further vertical travel so much of the floor has been removed for clearance. I will weld in a new panel to give clearance. This will make the rear seat even less comfortable. I plan to replace the cardboard spring with a conventional steel coil and add some further reinforcement to the mountings on the axle. The rear suspension is almost finished in this photograph. I made some last minute changes to the damper lower mountings after realising that the damper bush did not allow enough movement and the damper could have been damaged in roll. 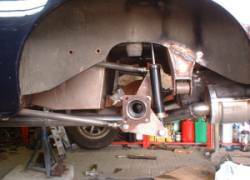 The rear suspension arms have been completed, and the axle tested for clearances. Luckily, everything seems to work. That's about it on the rear axle apart from painting. 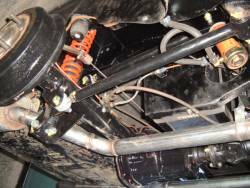 This shot shows the rear suspension and exhaust system with the brakes and driveshafts removed. Things start getting more complicated still when the brakes and fuel system are installed. There is just about space for everything although it's getting tight. With the car built up and lowered to the ground the rear suspension is sitting about 1 inch too low. It seems my estimate of the weight of the car was a little low. I'll order some stiffer springs for the rear end to give the correct ride height. I'm really pleased with the rear suspension. The rear end is so much more predictable than the original set up, and I can power slide around without fear of biting. Torque steer is hardly noticeable now. The car puts it's power down much more effectively. In a straight line I can leave two black marks on the road. Previously I had only been able to leave one. That's good news as I'd been considering an expensive Quaffe limited slip differential. The controlable oversteer is most evident when driving up a steep hill with lots of corners. Even in wet weather the oversteer can be gently provoked and the attitude of the car is very easy to control on the throttle.